Looking to increase productivity? Wanting to empower your users? Facing challenges when implementing change? You are not alone – these are all common barriers to running a successful business. Look no further – there is a solution: Velocity by Wavelink and TC8000 by Zebra technologies! There are so many buzz words in today’s business world – safety, productivity, ageing workforce, just to name a few. Not to mention the endless number of acronyms – WHS (workplace health safety), ROI (return on investment), FiFo (first in first out), and the list goes on… These are just some of the many pressures faced by organisations, with managers in today’s competitive world required to look after not only the profitability of the company, but also their biggest asset – employees. These challenges do not discriminate and are not specific to industry, workforce or demographic. It therefore comes as no surprise that Zebra Technologies have recognised these challenges and developed a mobile computing device focussed on supporting businesses to achieve profitability through improved productivity, whilst also empowering employees with a product they find easy to use, leaving the frustrations of day to day processes behind. From back of warehouse to the retail floor, the Zebra TC8000 brings with it a revolutionary new form factor, boasting productivity enhancing innovations whilst addressing safety through improved ergonomics and employee comfort. Coupled with the Android OS the TC8000 is a ground breaking approach to mobile computing devices. The design of the TC8000 has been so well thought through that each improvement cannot be discussed in isolation. 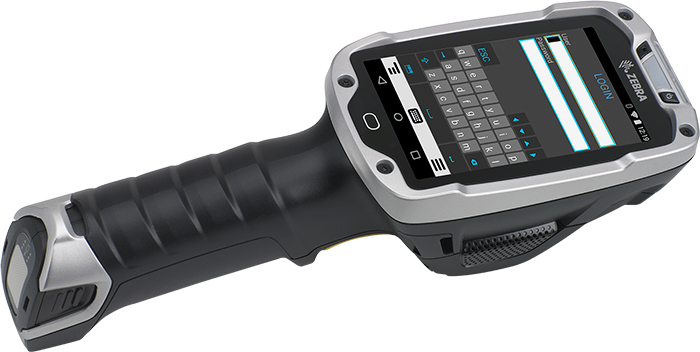 Its super rugged design with a tested drop of 8M and IP65 rating has not impeded Zebra’s ability to develop a lighter device, with Zebra boasting a weight which is 33% lighter than traditional models. To help achieve the lowest weight possible, a modern 4 inch touchscreen is incorporated, removing the need for a physical keypad, a change which has seen users achieve faster input speed with a reduction in errors trialled to be approximately 60%. The entire look and feel of the device has been modernised and users are able to enjoy a comfortable mobile computing device that allows for mounted or wearable scanning whilst also supporting voice picking. Changing from the traditional “top heavy” weighting, Zebra have re-arranged the location of the handle, scanner and display with the aim to move the centre of gravity to be in the palm of the hand. The relocated scan engine, available in 1D or 2D, is now positioned directly behind the touch screen, abolishing the need for any type of tilt during use. Tilt to read, tilt to scan and tilt to verify are a thing of the past, with the ergonomic design reducing wasted motion through the wrist and the fatigue associated with the repetitive movement. Through these changes Zebra has reported improved productivity with a saving of 2 seconds per scan. Further productivity improvement is achieved through the “hot swap” battery which ends the need to power down the device when changing the battery. Challenged with achieving a high end innovative device whilst not compromising the technology expected in today’s modern world, Zebra have ensured the TC8000 comes with a full feature set incorporating 1GB RAM, 2GB or 4GB Flash Storage, Bluetooth 4.0, and WiFi (802.11b/g/n), with a camera option available. Zebra Technologies have certainly done their homework and delivered a ground breaking mobile computer – the TC8000. Wavelink has not only identified these challenges but addressed them with their updated Terminal Emulation (TE) Velocity. Android devices were first introduced to the rugged mobile computing market in 2011 and their popularity has continued to evolve and grow. So too has the look and feel of the way these devices operate and many businesses are now finding they are left behind with archaic device platforms, leaving users working with obsolete technology. 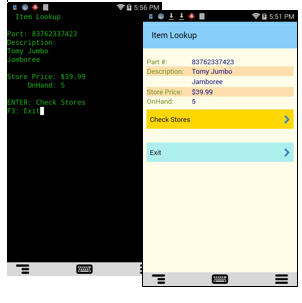 In late 2011 following closely behind the introduction of Android to the rugged mobile computing market, Wavelink first introduced their Terminal Emulation (TE) for the Android operating system (OS) – Velocity. A huge step forward at inception, technology continues to modernise and the original green screen terminal emulation (text based user interface) presentation is no longer appealing to the modern workforce. Despite the outdated challenges faced by users with the green screen – hard to read (especially for our ageing workforce), and slowed productivity due to navigational requirements (moving between alpha and alphanumeric) – familiarity gives employees a feeling of security and users are often not willing to adopt change. Meanwhile Warehouse Managers are feeling the pressure to increase productivity and reduce costs, whilst trying to manage negative feedback from employees who are not conducive to change. “But this is how we have always done it, why change what works?” is a common response to any manager looking to implement change – no matter how big or small the change may be. A frustrating situation, fortunately the answer isn’t as difficult as we may envisage. Enter the updated platform that is Velocity today. Presenting Telnet applications to employees in a modern format, the updated Velocity no longer uses the green screen and brings forward a more modern team utilising the up-to-date technology they are used to. Providing its users touch enabled interface, Velocity converts your existing host application from text based to a modern touch enabled bright screen. From tap and swipe navigation, customised on-screen keypads allowing the ability to provide users a simplified interface, colour coded prompts bridging the language barrier (ie: tap green for yes / red for no), and colour coded tasks (ie: blue may represent picking and yellow may represent receiving), Velocity has brought terminal emulation into the modern era. Everywhere we turn we are surrounded by smartphones and their modern functionality. Velocity by Wavelink has enabled the workplace to adopt this familiar functionality on its Android applications and bring a modern and interactive platform to the workplace. Increased productivity and a team excited for change – all while using your existing investment. Velocity by Wavelink can certainly deliver.